I love to learn and think and draw and write. As I child I wanted to remember things. I used to sit on the floor of our living room flipping through photo albums: remembering. Later, I wrote stories about the images I remembered in my diaries and journals. 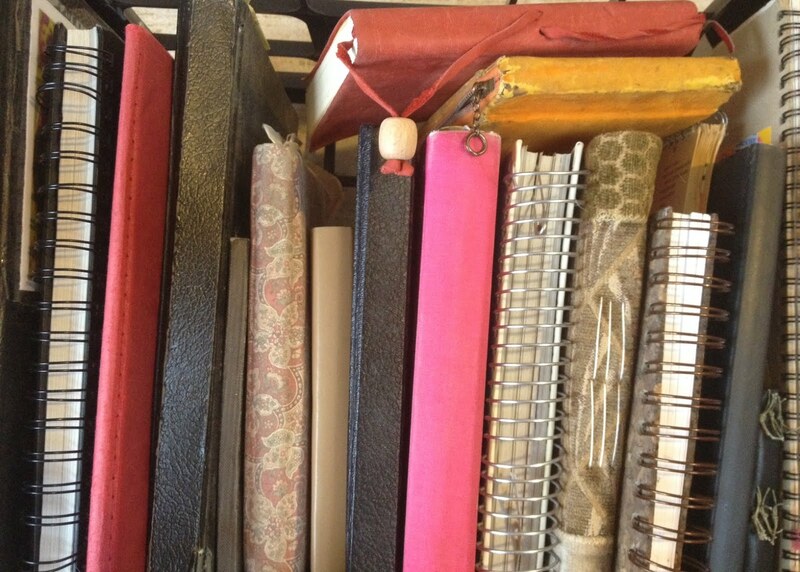 I’ve kept journals—or idea books or a writer’s notebook—since I was young. I don’t have them all, thankfully as they are getting to be something of a storage issue. Plus, I don’t think I want to see everything I wrote as teenager or child. The “Normal Rockwell Diary” from my teens is enough to cringe over. Like all teenagers who enjoy writing, I wrote poetry (badly), I processed feelings. I wrote letters and kept lists. 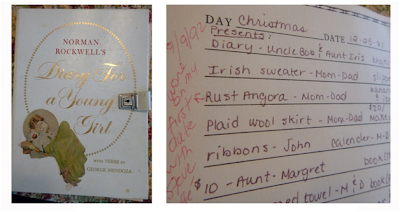 I laughed over this Christmas list from the early eighties—I was keeping track of gifts so that thank you note writing—required before the New Year—would be easier. What I love seeing in that Christmas list though is the red writing in the left margin. Sometimes when I go back through my journals, I add notes. Those notes remind me how story and memory have layers. 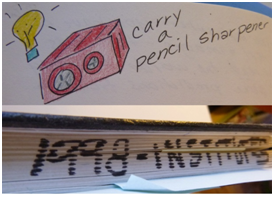 Notes help me refine and rethink, like this reminder to always carry a pencil sharpener from a 1998 summer literacy institute journal. I write the years and sometimes conferences or events across the tops of my journals. I have a journal of the first year of my marriage, several sermon journals, even a camping journal. Mostly though I have lots of everyday, work-horse journals—sketchbooks. The edge labels help me find things later. Sometimes a friend will say, “remember the time we were listening to…. and you drew that picture of… can you find that? I want to cite that presentation.” I can usually visualize the page of notes and find it by year on the shelf at home (pictured below) or school. I write in composition notebooks with my students. A few of those are pictured on the left. I prefer to use sketchbooks myself. I like the unlined pages and size choice for my own notes and ideas. As an adult I write to learn in my journals and I use them as writer’s or artist’s notebooks. 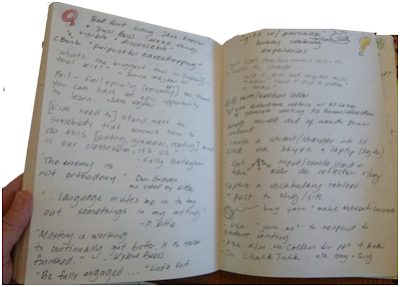 I collect and experiment with ideas in my notebooks. I like to begin new journals with photographs and bits of things that inspire my thinking. I usually draw and color a piece of word art on the first page. I’ve always wanted to print these on fabric and make tote-bags: one day. My journals keep those one day dreams. They also track everyday things like meetings and conferences. I like to take illustrated notes. The drawings in my notes help me remember the information. As Marzano says in Building Academic Vocabulary: logogens and imogens. Memory is made up of words and images. Mine sure is. 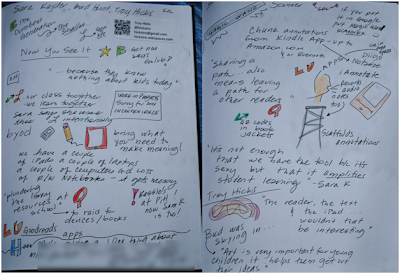 I’ve written about my note taking on my teacher blog here and here. If the arrow has a red L next to it, then I’m collecting connecting language and paying attention to how the speaker segues from one idea to the next. That’s me saying Hmmm… and recording my thinking. • a yellow light bulb for an idea. If it has a red T next to it that is a teaching idea, a red W means workshop. 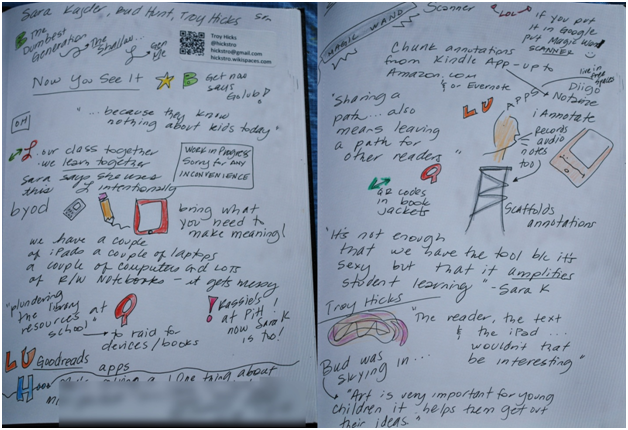 You can see most of these codes in my notes from one of my favorite NCTE sessions: “Reports from Cyberspace” presented by Sara Kajder, Troy Hicks and Bud Hunt. As I have time while note taking, I create an index in the back of the journal. I reserve a page (or two) for book titles, ideas, quotes, questions and things I want to look up and I note that code at the top of the page then review my notes and list them there. Creating the indices helped me to follow through on the ideas I get while listening to and learning from others at conferences or in meetings. I was tracking a book list in my journals long before GoodReads or Amazon wish lists—though I do collect books in those places now too. Aside from notes, I draft poems, art and other writing in my journals too. Here’s a poem I drafted for one of my sons early birthdays. 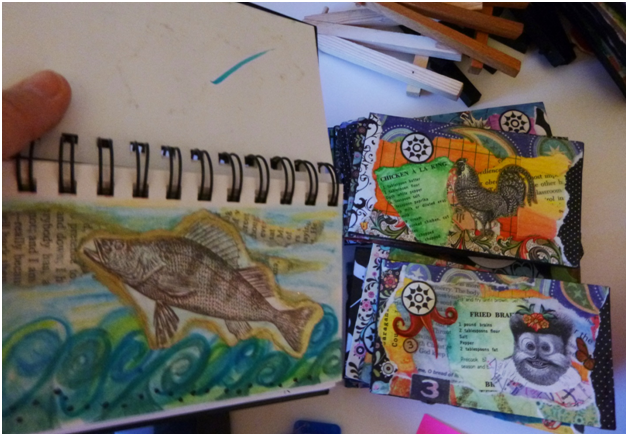 This animal collage in my journal on the left led to the collages I create on library cards on the right. I’d be lost without a journal. I take them everywhere. They are play spaces. There is always something to learn, explore, draw or do. 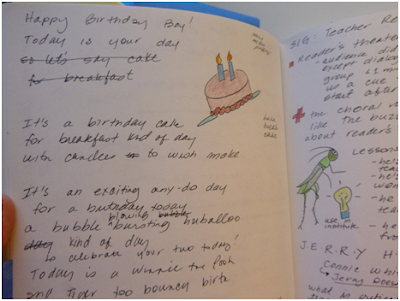 My journals are memory keepers and idea generators. They feed my spirit. In these high-stakes times as a teacher, the second life I can live in my journals keeps me creative and keeps me growing. 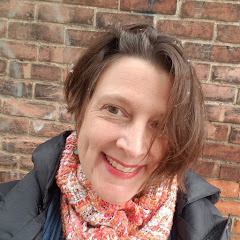 Lee Ann Spillane has worked as a llama wrangler, aerobics instructor, head sidewalk sweeper, freelance writer, lunch maker and backyard chicken farmer. Through it all, she teaches. A National Board Certified Teacher, find her learning with tenth and eleventh graders at Cypress Creek High School in Orlando, Florida. Visit Lee Ann’s virtual classroom online here. 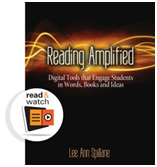 Lee Ann has generously offered a free copy of her e-book READING AMPLIFIED to a commenter on this post. Please leave a way to contact you along with your comment, and we will announce a winner on Sunday, January 26. In really enjoyed reading this entry! Of course, we met lat the last IRA conference because I noticed your neat journals. Since my class was involved in a visual journal project I was very interested to see what you were doing. As I read this post I am very struck by your organizational system. Lately in my first year of retirement I seem to have become obsessed with taking pictures and examining the world in this way. I too have always kept journals and then blogs so it is so interesting to see how someone else uses them to interpret the world. Anyway I really enjoyed this post and it is one I want to share! Thanks, Meredyth! I so enjoyed meeting you at IRA last year--and I love the photographs you post online. I'm glad you see this as "one to share." Though I enjoyed the entire post, one line really jumped out at me: "They are play spaces." I love that. Do play in journals or with writing too, Liz? I'm glad that line stood out. Thanks for commenting. Amazing work. 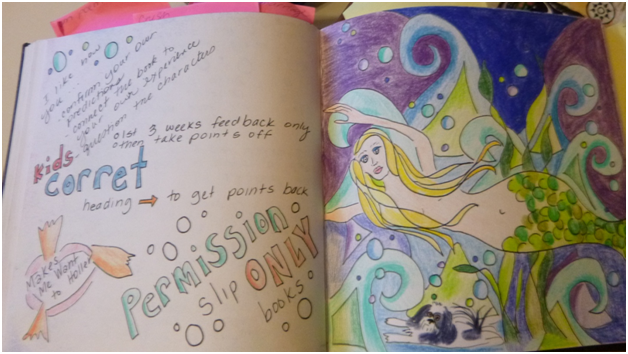 Your students must be inspired by your journals, too, Lee Ann. Every student keeps journals at my school, so I will certainly share this with the teachers so they can then share with the kids. I have many journals too, but have never thought of indexing them-great idea. 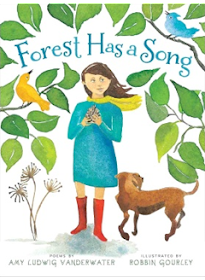 Thanks for such a 'full-of-ideas' post, Lee Ann! Thank you for the kind words, Linda. I enjoyed peeking into your notebooks too. I'd love to see your students' journals. Have you written about them on your blog or shared them here? I'll see if I can post some old copies I have. The main goal for these journals is field work. They capture any experience out of the building, and they go often! 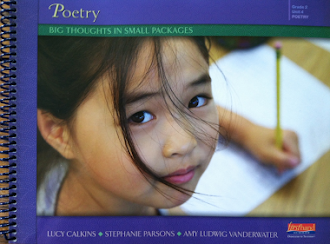 Other parts include writers' journals or notebooks, like the comp books you mentioned. But teachers work on sketching practice and brief notes often. Practice helps. I think I've mentioned them, but really never shared different ones. First, I love those drawings you do on the front pages of your new notebooks. They're beautiful. You should scan them and make them into something. Second, the codes you use are so meaningful. What a super system! Your wow made me chuckle. 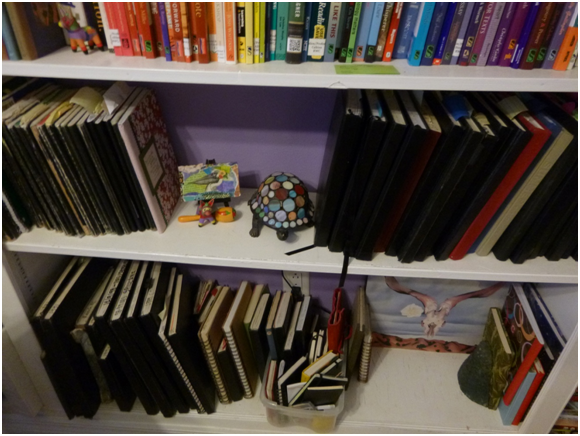 I have two shelves of journals at school too. They are nearly a storage concern, but I can't give up the fun. Can't wait to peek into your notebooks tomorrow! Your sketches and collages are beautiful. They are so carefully crafted and hold so much of you inside of them. What a treasure this was to read and a treasure for you to keep. Oh, thank you Betsy! The journals are a treasure to me and every time I revisit them I find a surprise. I'm tickled you liked the art too. This is such an inspiring post, Lee Ann! Your color-coding system is so smart, and I love the idea of our journals being "play spaces." Thanks for sharing! So many fun new things to try in my notebooks! Thank you for the inspiration(s)!!! 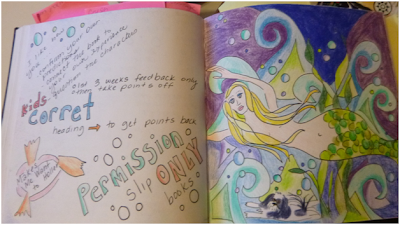 I adore my play-space, spirit-feeding journals but I have never indexed them, and some of my ideas do get lost in the shuffle. Thanks for the encouragement to try to keep up with what's inside them better! You are a writer, artist and you are organized, too boot. I am in awe! I enjoyed the peek inside your notebooks. You are amazingly artistic. I would love to be able to draw and create like that. You have a lot of notebooks! Much to think about here.